Colourpop Liquid Lipsticks are quite a rage since they were launched. They are available in four variants - Ultra Matte Lip, Ultra Satin Lip, Ultra Blotted Lip, Ultra Metallic Lip. Previously, I've tried their Ultra Matte Lip in Lumiere 2 and Bad Habit, Ultra Satin Lip in Alyssa and Ultra Glossy Lip in Take A Bite. 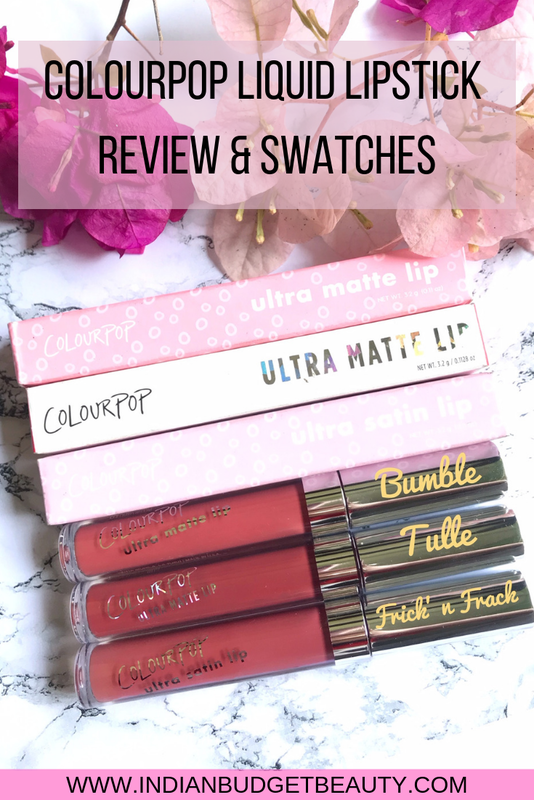 I love their formula and shades so I picked up Bumble and Tulle from the Ultra Matte Lip range and Frick' n Frack from their Ultra Satin Lip range. Without further ado, let's just dive into the review. I freaking love Colourpop's packaging. They have different shades of unicarton which looks very pretty as well. I am a person who never throws away the unicarton, so its an added advantage if it looks beautiful as well. Colourpop Ultra Matte Lip Bumble comes in a pink unicarton with white detailing, Tulle has a white unicarton with holographic detailing (Same as Lumiere 2), and Frick N' Frack has a light pink unicarton with white detailing. All of them comes in a lipgloss kinda packaging. They have a doe-foot applicator which pretty much does the job. I love the way these liquid lipstick look. They are very sleek and the color is see through. 'Colourpop Ultra Matte Lip' and 'Colourpop Ultra Satin Lip' is written in a holographic form. These shade are very very pigmented, so all you need to apply is a light layer. They have a creamy consistency. Ultra Matte Lip dries within 30 seconds and becomes budge-proof and transfer proof. I suggest that you use a lip primer or a lip balm underneath. It does apply smoothly and evenly. Ultra Satin Lip has similar consistency and pigmentation as the ultra matte lip. They are super comfortable on the lips, non-drying but are not transfer proof. I love the formula of Ultra Satin Lip as they are very comfortable to wear and are non-drying. They Ultra Matte Lip are a little bit uncomfortable to wear as they are super matte and dries your lips. TULLE: Tulle is described as a deep dusty burgundy. It looks very vampy on my skin tone but I totally love this shade. It is bold and once again brightens my skin tone. It will look good on all Indian skin tones. I got this shade especially after seeing Arshia Moorjani's lip swatches. FRICK N' FRACK: Frick N' Frack is described as a rosy terracotta. This is the shade which I've worn the most. I got this especially because it is the dupe of Kat Von D Lolitta. The Ultra Matte Lip lasts for about 6 hours. They are totally transfer-proof and does not budge at all. Whereas the Ultra Satin Lip stays for 6 hours but is not transfer-proof, they will transfer. After having a heavy oily meal, the Ultra Matte lip still goes strong, but the Ultra Satin Lip fades away. Colourpop never fails to surprise me. They have such a vast shade range. I'm a girl who totally loves rocking warm dusty shades which have browny tones. So, these three shades Bumble, Tulle and Frick N' Frack were totally up my ally. Colourpop Ultra Matte Lips are super pigmented and can be worn throughout the day but the only con is that they are very drying. So, I'd suggest that you wear a lip balm underneath. Colourpop Ultra Satin Lips have similar pigmentation like the Ultra Matte lip. I freaking love their formula, totally comfortable on the lips and very lightweight. But the only con is that it is not transfer proof. I love the shade Frick N Frack and their ultra satin range is so comfortable. However, I don't love the ultra matte range, too drying for me.